San Franciscan Isadore Zellerbach founded his paper manufacturing company, Zellerbach Corporation, in 1924, and merged it with Crown Willamette in 1928 to create Crown-Zellerbach (which dropped its hyphen before constructing this building). The Crown Zellerbach Headquarters Building was built in 1959 when the company was at the zenith of its success and could afford a grandiose corporate statement. In 1986, Crown Zellerbach was acquired by James River Company in an extremely hostile takeover by British financier Sir James Goldsmith. The Crown Zellerbach Headquarters Building, designed by Skidmore Owings & Merrill, LLP, was San Francisco's first glass curtain wall tower in the International Style, built just one year after Mies van der Rohe and Philip Johnson had perfected the style in their Seagram Building on Park Avenue in New York. Another first for San Francisco was locating the building in a private plaza, an idea subsequently duplicated with mixed results. A third innovation was the use of horizontal steel girders stretched across the entire width of the building eliminating the need for interior supports and ushering in the Age of Cubicles and the Age of Dilbert. 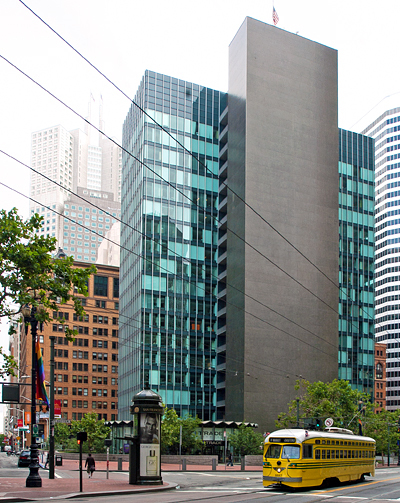 The photograph shows the Market Street view which is how most visitors to San Francisco will see the building although this is actually the back of the building. Because Market Street was in decline in 1959, the main entrance was placed on Bush Street in a block that a casual flâneur is unlikely to visit today. The canary yellow streetcar shown in the photograph is No. 1057 which is painted the livery of Cincinnati, even though it was built for Philadelphia in 1948 and served Philadelphia from 1948 to 1989. It was purchased by Muni in 1992. In 1898, Charles August Fey invented the three-reel bell slot machine in his workshop which stood at the corner of Market and Bush Streets where the Crown Zellerbach Building stands today. California Historical Plaque 937 commemorates his liberty bell slot machine.